Chico thinks the tent is a doggy play palace! Our Coleman Sundome 2 person tent got here a couple days ago. 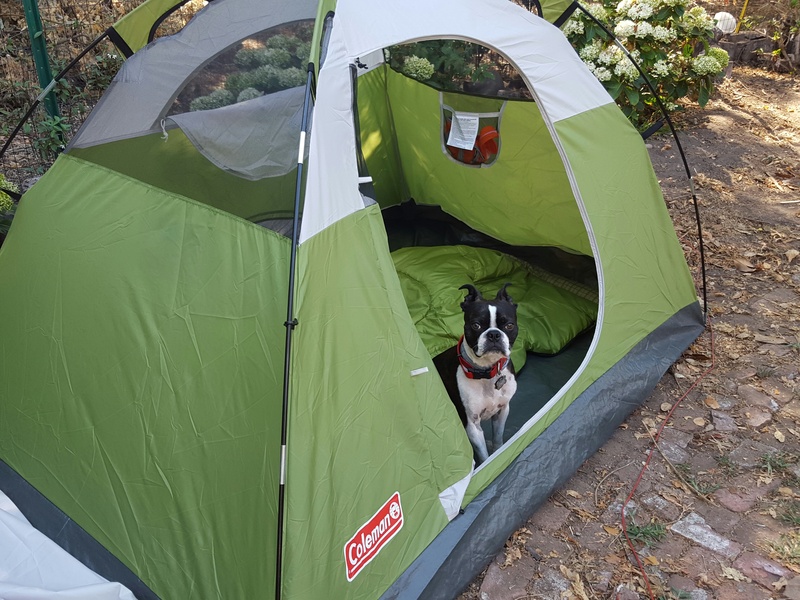 I wanted to practice setting it up, and sleeping in it since I have to set it up in the dark the first night of our road trip, and Chico, my dog, has never been in a tent before. I actually watched a couple videos on you tube before the tent arrived–warning, most videos on youtube about this tent are copies of other people’s videos, or people just reading the Promo Material for the tent. I am doing this car camping roadtrip on a budget, and writing about the things I use to see how they really hold up. Here is my mini review and initial impression of the Coleman Sundome 2 person Tent, we shall see how it holds up on the road. I found it amusing that the bag the tent comes in says backpacker tent, IMHO it would be too heavy…Maybe it could be used at a base camp that one only has to hike a couple miles to, but no way would you want to carry this 10 or more miles–I wouldn’t even want to carry it 3 miles. However, I am one of those keep everything light hikers. I am not an ultralight hiker, as I can’t afford it lol. But you would never catch me with a 40 or 50 pound pack, something people love to brag about! I always try to stay under 25. Under 15 for day hikes. I set it up with no real problems, except my backyard is sandy, so the stakes that came with it were too short to really take hold or offer it stability, and I had to move it over to more solid sand/dirt mixture, which was still pretty loose. For this set up I just used everything in the original box though I did buy the Coleman Tent Kit for later use. I was told I would want to buy better tent stakes anyway, and I also didn’t have a mallet. Sure I could’ve driven to 2 different stores and saved a couple of dollars and just bought the mallet and stakes, but time is worth a couple of dollars to me. I had some friends tell me that they rarely stake their tents, only when they thinks its going to rain and be windy–some said that they just put every heavy item they have in their tents. I feel better staking my tent. I’m glad I did buy the kit, the stakes in the kit are longer and stronger, and it also comes with a mini broom and dust pan to sweep out your tent, which I needed after just a couple hours in my backyard! I am pretty sure I can set this up in less than 5 minutes on the road. Even with having to move it, it took me less than 10 minutes. We shall see how the Coleman Tent Kit works on the road. Some people think that I am crazy to think a dog needs to be trained how to act in a tent, or to sleep in a tent, and that we practiced sleeping. I prob didn’t do this with my last dog, but I also wasn’t camping alone with her, and we were at some pretty remote places. I am well aware that not everyone loves dogs, so I want to make sure that Chico is well behaved in the tent and not barking, or, keeping me up all night. After ten minutes of this and not being able to get him to settle down, I decided to try again later with pillows, and his Octopus toy that he sleeps with in bed. This time, he settled down, but for the first 10 minutes he sat straight up staring at the door, as if on guard, but then he finally nudged me to come under the sleeping bag and we took a nice map together. He woke once when someone walked by 100 feet away and did a small bark, not his guard dog bark, and then came back under the sleeping bag, so I think we got this. And yes, Chico has a really large guard dog bark for a Boston Terrier. Easy to set up, sturdy, the floor seems like really strong tarp material, I’m not worried about Chico’s nails puncturing it. It is not a 3 season tent as it has huge mesh windows only covered by the Rain Fly. Coleman doesn’t advertise it as a 3 season, but some reviews said it was. Do we even have 3 seasons anymore? You can leave the rain fly off for stargazing….but as a woman camping alone, I would rather be able to just zip something over my windows, than get out of the tent and put the rainfly on when I was done stargazing, I am not going to leave my windows open for people to look into all night long and when they wake up before me in the morning–I am a later sleeper. It is not No See Um mesh, you can see really well into the tent ,and without actual window covers, I feel it would be too cold to be a 3 season tent, we shall see, it might drop to 50 at one of the places I am camping, but my sleeping bag should handle that. The tent is 5 x 7, 2 people can sleep in this, might be tight if you are more than average size. I will have plenty of room. I didn’t use a footprint, and the funny thing is, people kept telling me that I needed one, and then would say that they don’t use one themselves. I will most likely eventually get a tarp to use as a footprint. I didn’t use extra waterproofing or sealant, as it says that it is waterproof, and I thought to really review it, I should use it as it originally came first. I will also use a twin air mattress that I already owned, when I stay for more than a night somewhere.Its not a camping air mattress, but I’m in a car so have some leeway. 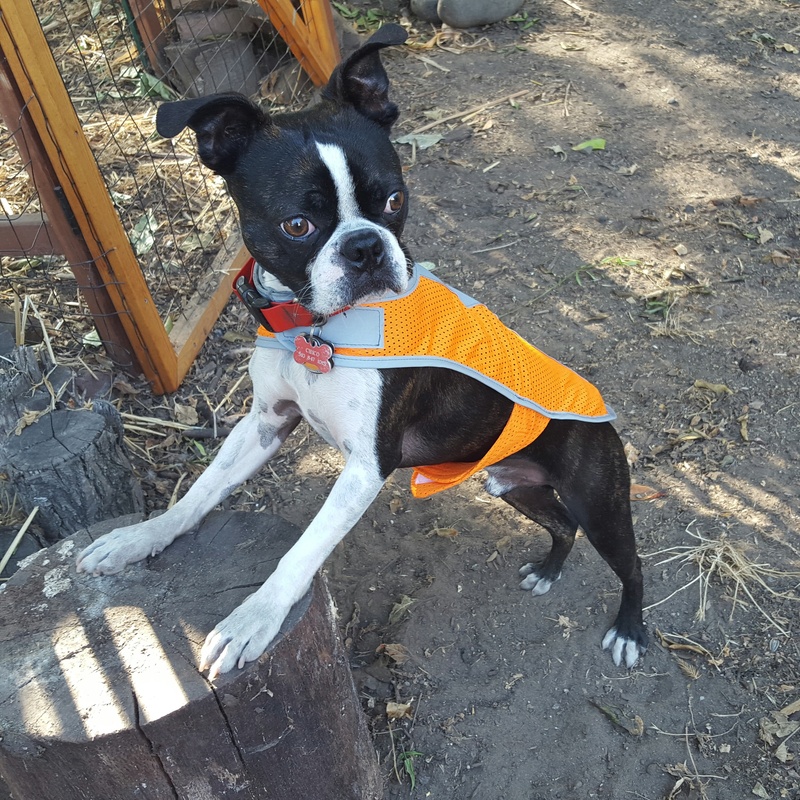 **I am not a representative for Coleman, they just seem to have the best name and reviews in budget camping items…Being that I am traveling alone with my dog, I’m not really ready to go with a no name item that I have never heard of, that has average reviews. The Coleman stuff I bought all has 4.5 or higher out of 5 stars. ← Taking the plunge-Our first car camping trip! Across the country, and on a budget.